DUNDEE (Photos Below)-The Lady Scots soccer team fell to South Seneca, Friday, Sept. 16. The final score was 6-0. Goalie Andi Wood recorded 17 saves for Dundee. With the loss, Dundee's record is now 0-5. WATKINS GLEN--The Watkins Glen girls and boys varsity soccer teams lost in the final round of the GLM Memorial Soccer Tournament, Saturday, Sept. 17. The girls fell 3-1, while the boys lost 5-1. Both teams faced Dryden in their last game. The Odessa-Montour boys team beat Dundee 8-0 in the tournament consolation game. 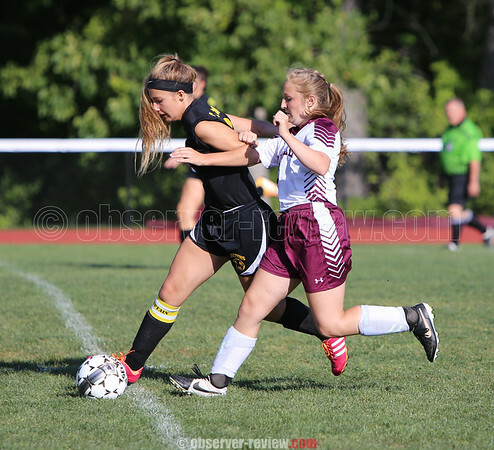 ODESSA (Photos Below)-The Odessa-Montour girls varsity soccer team fell to Spencer-Van Etten, 3-2, Thursday, Sept. 15. Kennedey Heichel and Sage Garrison each scored a goal for the Indians. Goalie Gillian Clark recorded 11 saves. LYONS--The Dundee varsity football team fell back to a losing record following a 47-18 away loss to Lyons Saturday, Sept. 17. The Scots are now 1-2 going into the upcoming home contest against Clyde-Savannah Saturday, Sept. 24 at 1 p.m. Both teams scored in the first quarter, with Lyons edging out the Scots for a 7-6 lead. The teams pulled the score up to 13-12, Lyons in the second quarter following a 52-yard touchdown reception and a 99-yard kick return by Dundee's Damon Empson. However, the Scots took a 21-point deficit into the half with a score of 33-12. Dundee's woes continued 13 seconds into the second half as they turned the ball over on an interception. Lyons scored on their next drive, taking a 40-12 lead over Dundee. Empson had a big 39-yard reception to set the Scots up at the Lyons 24-yard line. The offense moved the ball within three yards of the goal line, and Samuel Richards picked up the score on a three-yard rush to bring the score to 40-18. The Dundee defense then forced a turnover on downs to take the ball over on their 20-yard line, but an interception was thrown with 15 seconds left in the third quarter. While the pick was returned for a touchdown, a block in the back penalty erased the Lyons score. Lyons scored on their next possession to open the fourth quarter, extending their lead to 47-18. Dundee's offense drove into Lyons territory, but another interception turned the ball over at the two-yard line. Lyons would run out the rest of the clock to finish the win at 47-18. PENN YAN--The Penn Yan varsity football team fought against their losing record in a big way Friday night, Sept. 16, as they dominated Waterloo on their way to a 52-6 victory. The Mustangs will take a 1-2 record into next week's away game at Midlakes Friday, Sept. 23 at 7 p.m.
Quarterback Will Rogers led the team through the air, going eight for 16 for 152 yards and three passing touchdowns. He threw no interceptions on the game. Rogers also picked up five rushing yards and a rushing touchdown on five carries. Running back Dylan Stape led the ground attack with 10 rushes for 142 yards and two touchdowns. Fullback Nick Irwin added points on the ground as well with his one carry for nine yards and a touchdown. Running back Riley Marsh saw 13 carries throughout the game, contributing 32 yards. The receiving crew had a big game as well, with tight end Conner Fingar having two receptions for 46 yards, including a 37-yard touchdown reception. Wide receiver Jacob Whitford added two receptions for 40 yards and a 38-yard touchdown reception, while wideout Desmond Battin had two receptions of his own for 22 yards and a touchdown. Battin also added a touchdown on special teams. Defensively, Fingar had six tackles and one assist, Stape had four tackles, four assists and a sack, while Irwin added five tackles and three assists. Marsh added four tackles and two assists, while lineman Cadin Lloyd had five tackles, three sacks and a fumble recovery. Lineman Jack Peterson and Battin had fumble recoveries as well on the day, while Whitford added an interception. Peterson also added five tackles, while defensive back Eric Ledgerwood had four. ODESSA (Photos Below)-The Senecas' varsity volleyball team beat the Indians in three sets, Thursday, Sept. 15. The final scores were 25-14, 25-10, 25-21, Watkins. For Watkins Glen, Mariah Gonzalez recorded eight aces, 20 service points, six kills, six digs, and 17 service points. Amanda Pike had three aces, 16 kills, and two assists. Hanley Elliott earned one ace, two service points, one kill, 20 assists, and five digs. Emmie Bond added five aces, 11 service points, three kills, and five digs. Kathryn Losey recorded two service points, eight kills, and two digs. Megan Hazlitt had three aces, seven service points, one kill, and two digs. For Odessa-Montor, Alyssa Crout recorded three aces, three assists, two kills, and six service points. Cheyenne Barrett had one ace and six assists. Dasia Herrmann added five digs and two service points, while Paxton Brown earned three digs.